"We are going to bring disarmament and peace," Interior Minister Nestor Reverol told Reuters during one confiscation event. 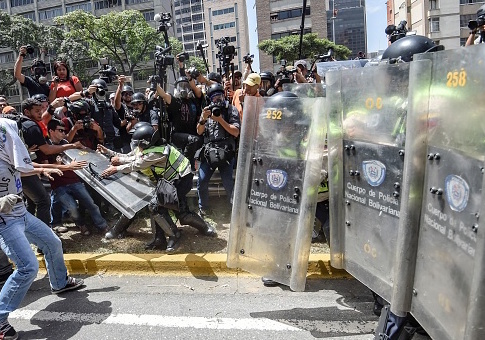 The Venezuelan government justified the gun bans and confiscations by saying they were needed to combat the country's violent crime and murder epidemic. However, statistics reported by the nonprofit Venezuelan Violence Observatory show the murder rate in Venezuela increased from 73 murders per 100,000 inhabitants the year the gun ban was instituted to 91.8 murders per 100,000 inhabitants in 2016. Statistics from the Federal Bureau of Investigation show the United States murder rate in the most recent year available, 2015, was 5 murders per 100,000 inhabitants. As protests and unrest increase in Venezuela, Maduro's regime has created a landscape where civilians are disarmed but his supporters are not. The latest round of mass demonstrations in the streets of Caracas have already claimed five lives. Experts said the current protests are more widespread than in the past, and the country may be at a breaking point. "Ongoing opposition protests are generating strong turnouts and spilling over into typical Chavista strongholds, suggesting that social dynamics may be drawing closer to a tipping point," Eurasia Group analyst Risa Grais-Targow told ABC News. "The excessive ambition of [our] enemies threatens the peace and stability by carrying out a criminal agenda loaded with hate that includes terrorist acts, disturbances, looting, vandalism, different forms of violence against innocent people and public health facilities," Defense Minister Vladimir Padrino Lopez said of the unrest, Fox News reported. He went on to say the protests are creating an "anxiety in the public, anarchy and chaos, with the ignoble aim of toppling the democratic government." There are no reports on how Maduro's regime plans to use his newly armed supporters to counter the demonstrations in the future. This entry was posted in Issues and tagged Communism, Guns, Venezuela. Bookmark the permalink.